Boat Description The Albemarle 410 Express Fisherman is a sight to behold. 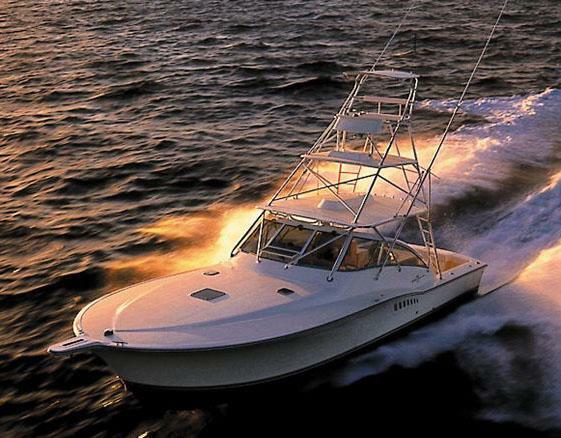 Striking lines, a dramatic Carolina-style flare, and unadulterated fishing systems adorn the exterior. Elegant refinements and comfortable appointments grace the cabin. And in her engine room, twin Cats supply speed and responsiveness. The 410 has a large cockpit equipped with a standard livewell, freezer, ice / bait cooler, tackle storage, oversized fishboxes, and transom door. Two steps up lead into the large helm area with a centered dash and wheel for maximum visibility and control. Wrap-around bench seating on both sides frames the helm and provides ample room for long runs out.